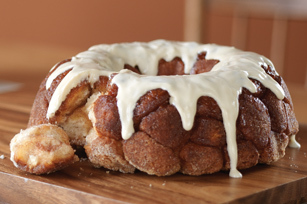 Leading the lineup of our favorite cinnamon inspired treats is this ooey gooey pull-apart bread. It's simply the best we've ever tasted. 1. PREHEAT oven to 350°F. Cut biscuit dough into quarters with scissors. 2. MIX sugar and cinnamon in medium bowl. Roll dough quarters in cinnamon sugar. 3. PLACE half of biscuits into greased 12-cup fluted tube pan. Drizzle with 1/4 cup of the melted butter. Top with remaining biscuit quarters and melted butter. 4. TOP unbaked loaf with remaining cinnamon sugar mixture in bowl. Bake 40 to 45 min. or until golden. Meanwhile prepare glaze (below). Let loaf stand 5 min., invert onto plate. 5. BEAT 4 oz. (half of 8-oz pkg.) PHILADELPHIA Cream Cheese, softened, and 1/2 cup powdered sugar in bowl with electric mixer until well blended. Add 1 to 2 Tbsp. milk, beating until desired consistency is reached. Spoon over warm loaf.